An ambient and electronic artist hailing from Ottawa Canada, Mike Carss has been releasing ambient music under the Altus name since 2004. His ambient music covers a tremendous amount of ground, ranging from pure light ambient to symphonic ambient to some very powerful dark and experimental ambient music as well. But despite the breadth of his work, the quality of his music is world class. If that weren't enough, Altus makes nearly all of his music available for free under Creative Commons. 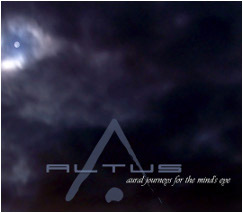 We at Earth Mantra listen to a lot of ambient music and Altus is one of our all time favorite artists. We're very proud to bring some of his music to our listeners.